In an alternate reality timeline in 1911 France, the Napoleon family line still rules, and the world still relies on coal and steam power leading to a war between France and North America for access to North America’s forests. In recent years, there is a lack of scientists, having all disappeared one by one and the few left have been rounded up to work under government supervision for the war effort. In the chaos of this society a teenage girl April and her talking cat Darwin search for her missing parents and grandfather, all scientists. She’s also attempting to perfect her family’s work on an invincibility serum that until now has only managed to boost her cat’s intelligence. Along with the help of street criminal and police informant, Julius, she is able to reconnect with her grandfather and pursue the mystery of the missing scientists. 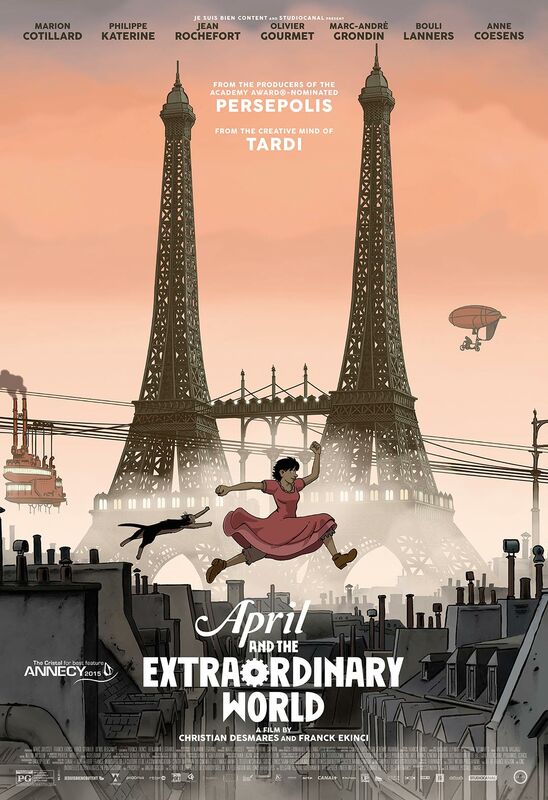 April and The Extraordinary World is a wonderful animated film for almost the whole family. Some of the action and drama may be too much for younger children, not to mention that it is subtitled and would have to read, but I think that this film would be great for families with children who may have outgrown the Disney animated fare and still have an interest in animated features. The story itself is well executed and all of the voice actors lend a great deal of believability and weight to these fully developed characters. Also one cannot discuss April and The Extraordinary World without touching on the animation itself. Simply put, this film looks fantastic by both of its definitions, the animation team does an excellent job bringing this world to life. Desolate of most vegetation, this steam powered technology is actually so well thought, it’s easy to believe that it could have existed. It is truly a well-defined and executed vision of an alternate timeline. If you are a fan of animated features, steam-punk imagery, or sci-fi adventures then I highly recommend that you check out April and The Extraordinary World.